1) Cripple the ability to effectively investigate and prosecute political corruption by state legislators and state-wide elected officials, including the Governor. 2) Eviscerate and destroy the non-partisan state agency charged with enforcement of state elections, campaign finance law, ethics and lobbying law. 3) Deregulate, almost completely, campaign finance law so that formerly illegal campaign coordination between candidates with outside special interest groups will be permitted (encouraged) and codified into law, far more secret money from outside of Wisconsin will influence our elections, and much more money will flow into the coffers of legislative leaders in the Capitol to quash dissent and hasten the possibility of further corruption and scandal. This massive, coordinated blitzkrieg on democracy and transparency commences on Tuesday, when the Assembly will debate Assembly Bill 68, partisan legislation that would exempt politicians from being able to be investigated for misconduct in public office, bribery of public officials, theft, all violations of campaign finance laws, all election law offenses, corrupt means to influence legislators, extortion, private interest in public contract, lobby law violations, criminal violations of state ethics rules, false swearing, and those additional crimes that may occur when a John Doe investigation is underway, such as perjury, bribery of a witness, and tampering with public records. It is astonishing that such legislation was even contemplated, let alone about to be rammed through the Wisconsin Assembly. Long-time (1968-2004) Milwaukee County District Attorney E. Michael McCann, who investigated and prosecuted former Democratic State Senator Chuck Chvala of Madison during the infamous Legislative Caucus Scandal in 2002, has said he and other prosecutors would not have been able to uncover the corruption in the Capitol had this ill-advised and obviously self-serving legislation been the law at that time. McCann, a long-time member of the Common Cause in Wisconsin State Governing Board since retiring as D.A. in 2004, wrote this opinion-editorial against AB 68, which appears in today's Milwaukee Journal Sentinel. For a more detailed explanation from McCann about what what is so wrong with this measure, how the John Doe process works, and why the Republicans are so intent on changing it, go here. On Wednesday, the Republican legislative leaders in the Assembly have tentatively scheduled for a vote, Assembly Bill 388, the completely unjustified legislation premised on a long sequence of unsubstantiated charges, false premises and fabricated events, in order to destroy the non-partisan Government Accountability Board. 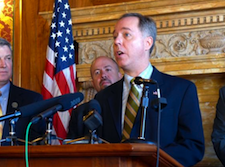 Common Cause in Wisconsin has long opposed this legislation, which would replace six non-partisan, retired judges with 12 partisan hacks who will, instead, act at the bidding of partisan legislative leaders and the Governor. And the ability of the GAB to investigate corruption will be eviscerated. This legislation will ensure that Wisconsin's elections, campaign finance law, ethics and lobbying law will be enforced – not according to the law or for the public interest – but instead for narrow, partisan political advantage and to shield corruption. Here is Jay Heck's testimony against AB 388 delivered last week at the Capitol legislative hearing. Also on Wednesday, the Assembly is scheduled to vote on Assembly Bill 387, the massive and secret hyper-partisan Republican re-write of Wisconsin's campaign finance law that was unveiled for the first time only 12 days ago and was made even worse that it was, as introduced, during a committee executive session on the legislation on October 15th. 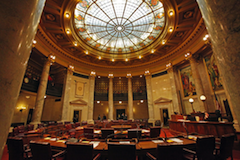 In short, Assembly Bill 387 will allow much more secret money from outside of Wisconsin to influence our elections and dictate our public policy-making process. 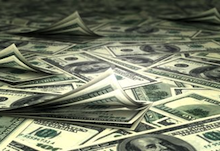 It will codify into law formerly illegal campaign coordination and allow legislative leaders to collect unlimited money for their legislative campaign committee "slush funds," which they control and which will guarantee virtual complete dictatorial power over rank and file members and allow far more secret money to influence everything that happens in the State Capitol. Scandal should follow in the not-too-distant future. To review why this legislation is so horrific for Wisconsin, go here, here, here, and here. 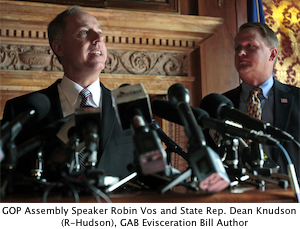 Assembly Speaker Robin Vos (R-Rochester) and State Senate Majority Leader Scott Fitzgerald (R-Juneau) are fast-tracking several seriously damaging, partisan measures this week. One will destroy the non-partisan Government Accountability Board (GAB). Another will deregulate Wisconsin campaign finance law and allow unlimited money – most of it secret – to flood our elections. The GOP scheduled a joint legislative public hearing for today – publishing the hearing notice just this past Friday night – for this hyper-partisan legislation. Two of the bills will dismantle and "partisanize" the GAB: Assembly Bill 388 and Senate Bill 294. Two other bills will deform campaign finance law by legalizing campaign coordination between candidates and issue advocacy groups, among other things: Assembly Bill 387 and Senate Bill 292. Spread this post far and wide. Forward it to your friends and family, share the link on Facebook and Twitter! To see a recent "debate" about the GOP's proposed changes to the GAB and Wisconsin campaign finance law between Jay Heck and a conservative blogger, go here. To hear audio on why the campaign finance proposal is a bad idea, go here. To read more on these issues and why they matter, go here, here, here and here. Please take action today. Good government in Wisconsin depends on your active participation! 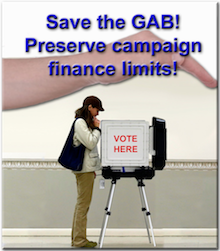 Public Hearing This Tuesday, October 13th on Destruction of the GAB and Campaign Finance Deform Measures! Very late Friday, when few people were paying attention, state legislative Republicans posted this notice for a public hearing on Tuesday, October 13th in the Capitol for measures to eviscerate the non-partisan GAB, and to destroy any meaningful contribution limits or limits on special interest money in WI elections, while effectively ending most disclosure and transparency of that money. Because they have so little regard for you or for the public interest, the GOP has scheduled a "joint" hearing for Tuesday so they only have to hear from citizens opposed to these horrible measures just once and they will likely limit testimony. The two hyper-partisan bills that will destroy the GAB are Assembly Bill 388 and Senate Bill 294. The two that will deform campaign finance law are Assembly Bill 387 and Senate Bill 292. Note: the hearing notice only mentions the Assembly bills. But the Senate bills are also the subject of the public hearing. Therefore, register to oppose both the Assembly and the Senate bills. 1.) Show up, if you can, at the Capitol on Tuesday morning and register against all four bills (and testify against them if you can). 3.) Spread this post far and wide. Hearing details are on the notice. Act now! The long, expected hyper-partisan measure to eviscerate the non-partisan Government Accountability Board (GAB) will be unleashed today in the State Capitol. It was concocted completely in secret, with no input from anyone other than other hyper-partisans and, if enacted into law, would fundamentally transform what was a nationally-admired model of effectiveness, efficiency and impartiality into a partisan, toothless backwater state agency completely under the control of partisan politicians. 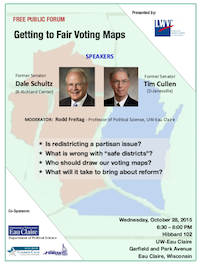 This severe mockery of good public policy is being inflicted on Wisconsin for one reason – to destroy and then assert control over an agency that did what it was designed to do: oversee Wisconsin's election, campaign finance, ethics and lobbying laws impartially and with a degree of independence from micromanagement by partisan legislative leaders and their lackeys. Their measure "divides and conquers" the GAB by splitting it apart into two divisions: Elections and Ethics. This measure also eliminates the most critical element of the GAB – the one that was absolutely the essential bedrock of the legislation in 2007 – its sum-sufficient stream of funding for GAB investigations for things like political corruption committed by legislators or governors. This measure would now make such funding subject to the approval of legislators. That would include legislators who might need to be investigated! Obviously, without this independence, the GAB becomes a partisan-controlled pawn. It won't be worth the office space it will occupy. 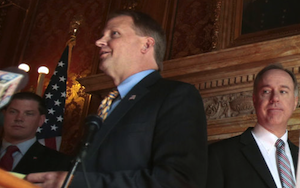 The solution had to be a bipartisan one, given the nature of the Caucus Scandal and the fact that the Wisconsin Legislature in 2007 was under split control. 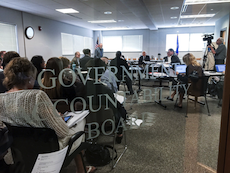 Both sides agreed that the old State Elections Board and State Ethics Board had to go because they utterly failed to uncover and investigate the burgeoning corruption that was occurring under the Capitol dome during the late 1990's. The GAB did everything it was asked to do and more, including skillfully overseeing more than a dozen State Senate recall elections and a Gubernatorial recall election. Conservative hyper-partisans launched a number of unsubstantiated charges against the GAB – all of which have been refuted and proven to be without foundation. But that doesn't seem to matter to the authors of this monstrosity, led by Rep. Dean Knudson (R-Hudson) and Assembly Speaker Robin Vos (R-Rochester). Control and partisan advantage is all that matters to them. There are currently 24 Republican legislators (12 State Senators and 12 State Representatives) who were in office in 2007 and who voted to create the non-partisan GAB. They will have to flip-flop and change their vote to support this hyper-partisan reincarnation of a completely impotent, toothless agency that the citizens of Wisconsin will have every reason to be ashamed of. Legislators are usually reluctant to reverse their position on any issue. But these 24 will have to do so to vote for this legislation. And they must be held accountable if they do. They will say "things changed" and that the GAB is "too partisan," and is a "rogue agency." None of these charges are the least bit true and all have been addressed and refuted. It is absolutely essential that you contact both your State Senator and your State Representative and demand that they oppose this legislation and support the preservation of the non-partisan GAB "as is." If you are not sure who your legislators are, go here. We have a chance to defeat this abomination, particularly in the State Senate, where we are within three votes of stopping it. But only if we act! To watch why this attack on the GAB is so misguided, go here. To read more about this issue and why it matters so much, go here, here, here, and here. And please make your voice heard! Jay Heck joins the guys to discuss new legislation brought on by the GOP.